ConnectedYou and CheerIoT announce partnership towards building an open ecosystem for IoT services including global cellular connectivity. COPENHAGEN, DENMARK, November 8, 2018 /EINPresswire.com/ — ConnectedYou (CY) welcomes CheerIoT on board the ConnectedYou ecosystem as an “IoT Accelerator” partner. 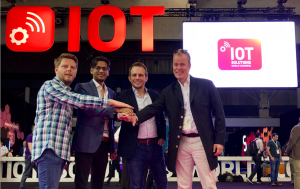 ConnectedYou, the IoT service orchestrator and CheerIoT, the IoT solutions and connectivity services company, announce a partnership towards building an open ecosystem for IoT services including global cellular connectivity. Enterprises developing connected products will be able to connect their devices globally to CheerIoT’s aggregated network(s) with ConnectedYou’s orchestration service platform. This allows customers to choose the most appropriate service providers in different regions around the world, with the ability to switch providers at-a-click remotely in real-time, should the need arise. This partnership will also allow enterprises who wish to have inhouse control over their connectivity setup with virtualized network operations as a service. This enables large enterprises to launch a global network at will, along with combination of the eSIM based connectivity orchestration from ConnectedYou. This provides enterprises the absolute control and power, with the flexibility to make their IoT roll-out future proof. This represents a major step for enterprises who seek to procure multiple service providers, granting them full independence and the best worldwide connectivity to expand their services after rollout. After all there is such a thing as “insurance by action” in IoT. Access is enabled using ConnectedYou eSIMs in both plugin and embedded formats and is managed through a single ConnectedYou web console and unified APIs. “Our partnership with CheerIoT is strategic and not limited to connectivity orchestration. Both companies will continue the good work in this collaboration towards delivering a truly open IoT ecosystem to clients and partners. This strengthens the CY offering to customers globally and many of these customers will benefit very soon in terms of expanded coverage and better pricing in more countries.”, said Parag Mittal, Chief Executive Officer & Co-founder at ConnectedYou. “Our mission as CheerIoT is to make IoT Connectivity affordable and accessible for everyone. That is why this partnership with ConnectedYou is a very nice step in this mission. ConnectedYou is first of its kind “IoT marketplace” bringing structure and market to a troubled industry by creating transparency and simplicity to the IoT universe and accelerating the entire industry. CY simplifies and future proofs IoT for customers into a seamlessly integrated first of its kind ecosystem platform. We are glad to partner up with CY, and we hope to welcome many customers via the platform.” said Jurgen ter Hoeve, Co-founder at CheerIoT. ConnectedYou eSIMs are fully managed by ConnectedYou as an independent provider and can be enabled with connectivity from any provider within the ecosystem. ConnectedYou is an independent IoT Service company offering a unique and unified IoT service to enterprises globally through a single access platform integrated with multiple technology and service providers. ConnectedYou’s service is based on 4 pillar approach encompassing Devices, Connectivity and Cloud Services and Value Added Services. ConnectedYou enables an ecosystem that allows enterprises to freely choose services and offers from suppliers, enabling the ability to remotely switch suppliers within the ConnectedYou ecosystem. ConnectedYou provides enterprises with a future proof orchestration for all their IoT needs keeping future innovation and improvements in mind. CheerIoT’s mission is to make IoT connectivity affordable and accessible for everyone, no matter if you are a big manufacturer or start-up. CheerIoT SIM Cards are specifically designed for IoT Connectivity initiatives. The SIM cards have the widest coverage access worldwide with redundancy to multiple networks within a country. This way, your devices don’t have to rely on a single mobile network. Because of the redundant network solution, the IoT project is protected for a single network outage. All CheerIoT customers are in full control of their active CheerIoT SIM-cards, thanks to the easy-to-use management portal. To inquire about this news item, contact pr@connectedyou.io.